Paints And Polish: Guess What! New China Glaze Nail Stripers Are Coming! Guess What! New China Glaze Nail Stripers Are Coming! I'm so excited about the new nail art stripers by China Glaze. 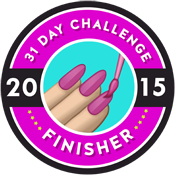 For all you nail art enthusiasts out there, you should be excited too. I can't wait to see how these babies perform. For someone who can't draw a straight line with a ruler, I have high expectations for these stripers. Probably too high. Let's face it, I still won't be able to paint tiny Piccasos on my nails. But maybe these stripers will get me just a bit closer to getting the courage to try. The selection of colors is wide: yellow, red, silver, green, orange, gold blue, pink, purple, white, black...ok, let's just say they've covered all the basics. Of course, these stripers will be available at Sallys Beauty. We love Sally's don't we? Nod your head. Can't wait to check them out. If you grab some before I do, let me know if you're painting tiny Monets on your nails.